The personal computer's rodent family took on a new member last November with the release of WIZ from CalComp of Anaheim, California. WIZ combines a mouse with an intelligent graphics pad and software templates. 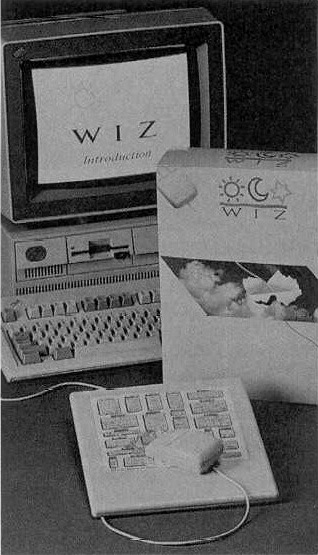 The WIZ mouse has three buttons with six programmable settings. The pad is a little larger than a standard sheet of paper and includes a clear plastic cover under which you can slide the templates. From the template menus you can select various commands without having to pull down menus. Available in PC as well as Macintosh versions, the WIZ offers 1000 dots-per-inch resolution. It will sell for $199 through the middle of February; then the price will climb to $249. PC and Macintosh templates for a variety of word processing, desktop publishing, CAD, and drawing programs retail for $49. An optional pen for easier drawing retails for $75. For more information, contact CalComp at 2411 West La Palma Avenue, Anaheim, California 92081: (800) 225-2667. The WiZ combines a mouse with an intelligent graphics tablet.